It will be visible over Israel the entire time (8.14pm on Friday 27th to 2.28 am on Saturday 28th). 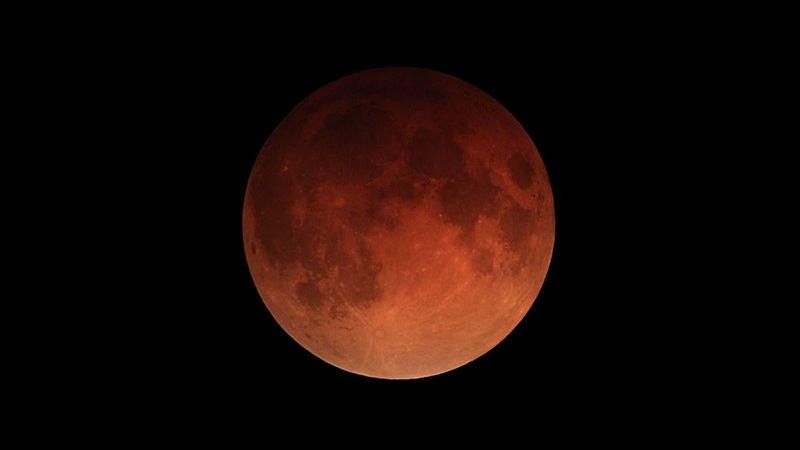 The moon will begin to be completely red at 10.30pm and the maximum eclipse where the moon is closest to the centre of the shadow of the earth cast by the earth begins at 11.21pm. It will not be visible in the United States of America. There was one in January and there is another one in July but they are different. The July one is unique. The full moon on the night of July 27-28, 2018, presents the longest total lunar eclipse of the 21st century (2001 to 2100). The total phase of the eclipse – called the totality – spans 1 hour 42 minutes and 57 seconds. Of course, there is something more awesome than a “Total Lunar Eclipse” or “Total Solar Eclipse” and that’s the ONE YAH / ELOHIM) who created the entire universe and all its intricacies by the power of HIS WORD (YAHUSHUA HA MASHIACH)! And HE (YAH) is calling for our attention in a powerful way!!! Practically, everyone in various parts around the world will see the longest eclipse in a century! The second total lunar eclipse of 2018 will be visible in various parts of Asia and Africa. Totality will last for 103 minutes, making it the longest eclipse of the 21st century. The date scheduled for the Special Blood Moon of the Century looks like this: 27/07/2018. Additionally, the date will fall on the start of YAH’S True Sabbath (sun-down Friday), a day, a time of rest from all work and Shalom! In this TORAH Parashah/Portion, we see Moshe Ha Navi/Prophet Moses narrating how he pleaded with YAHUVEH The LORD to let him cross over to the other side of the Yarden/River Jordan in order to see the goodness of the land promised unto the Children of Israel. Unfortunately, YAHUVEH GOD was so angry with him that he only allowed him to see the Promised Land from afar. 23 “Then I pleaded with Adonai, 24 ‘Adonai Elohim, you have begun to reveal your greatness to your servant, and your strong hand — for what other god is there in heaven or on earth that can do the works and mighty deeds that you do? 25 Please! Let me go across and see the good land on the other side of the Yarden, that wonderful hill-country and the L’vanon!’ 26 But Adonai was angry with me on account of you, and he didn’t listen to me. Adonai said to me, ‘Enough from you! Don’t say another word to me about this matter! 27 Climb up to the top of Pisgah and look out to the west, north, south and east. Look with your eyes — but you will not go across this Yarden. 28 However, commission Y’hoshua, encourage him and strengthen him; for he will lead this people across and enable them to inherit the land that you will see.’ 29 So we stayed in the valley across from Beit-P‘or. 36 Watch ye therefore, and pray always, that ye may be accounted worthy to escape all these things that shall come to pass, and to stand before the Son of YAH. A total lunar eclipse will occur on July 27, 2018. The Moon will pass through the center of the Earth’s shadow. This will be the first central lunar eclipsesince June 15, 2011. Since it will occur near apogee, this eclipse will also be the longest total lunar eclipse in the 21st century. the stars withdraw their brightness. and give His voice from Jerusalem. and a safe place for the children of Israel. and foreigners will cross through her no more. 12 I looked when He opened the sixth seal, and [a]behold, there was a great earthquake; and the sun became black as sackcloth of hair, and the [b]moon became like blood. 13 And the stars of heaven fell to the earth, as a fig tree drops its late figs when it is shaken by a mighty wind. For some reason, over the years, various YAH’S Amightywind Ministry Prophecies have mostly been released on the “27th” day of a month (any month of the year in line with YAH’S Will! This is a special day to YAH ALmighty! It has something to do with SHKINYINYAH GLORY (a.k.a RUACH HA KODESH)! This Ministry name was inspired by SHKINYINYAH GLORY (a.k.a RUACH HA KODESH) ALmighty who is the “A Mighty Wind” and “ALmighty Wind” that is blowing across the earth to wake YAH’S people up spiritually plus keep them awake! It is more about HER than it is about YAHUVEH and YAHUSHUA. That’s not to say that YAHUVEH and YAHUSHUA do not minister through it! They do as well. Remember that they three of them form The Holy Trinity GODHEAD! They rule in unison, therefore implying that when one speaks, they have all spoken in agreement. So, for the “Total Lunar Eclipse” which has not appeared in a very long time, to occur on this date of 27th July, there must be a very important message in the Heavens for all of earth’s inhabitants and most particularly, the Bride and Guests of YAHUSHUA HA MASHIACH!!! It is revealed in YAH’S Amightywind Ministry Prophecy 90 that Apostle/Prophet Elisheva Eliyahu started hearing the Seven Thunders (in 1988, I think) around 7 am. That time was specifically chosen in the Heavens because it represents YAH’S Complete Perfection and Shalom! MOMMA SHKINYINYAH GLORY explains why it was 7 am and 7 thunders. Also note that July 2018 is the 7th month on the Gregorian Calendar, hence making it special spiritually. This years’ July days have all been organised in a unique manner also. Click here for more information on this. Note that the eclipses in general were created for SIGNS and WONDERS. Additionally, more proof of signs and wonders in the Holy Biblical Scriptures is seen in Matthew 24 where YAHUSHUA HA MASHIACH mentioned some signs in the sky which would appear just before HIS Return for HIS Beloved Bride (and Guests). How ready are you for YAHUSHUA HA MASHIACH’S Second Coming could be at any time? Have you accepted YAH’S SALVATION? How much OIL do you have in your lamp (spiritually)? The upcoming “Total Lunar Eclipse” is an “ot” (Hebrew for sign)! YAH is preparing mankind spiritually in these last days by sending signs in the Heavens more often than usual. Note the word, “lunar” in the name of the eclipse implying something to do with the moon. Remember that the Children or People of Israel associate with the “moon” whereas the Goyim (a.k.a Gentiles) which is the rest of the world associate with the sun. The Hebrew Calendar is controlled and determined by the appearance of the moon (lunar) whereas the Gregorian Calendar is associated with the appearance of the sun (solar). The start of each Moed/Appointed Time is usually determined by the appearance of the moon. In fact, this Lunar Eclipse is appearing on the 15th day of the Hebrew Month called “AV / AV MENACHEM.” This day is called, “Tu B’Av.” It is similar to Valentine’s Day. It is a day of expressing love. The 15th day of each Hebrew month is when the full moon appears. In this case, there will be total darkness, there will be a blood moon. On the 15th of Nisan/Abib, we observe and celebrate the PESACH/PASSOVER Moed/Feast. On the 15th of Tishrei/Tishri, we observe and celebrate the SUKKOT (SUCCOT)/TABERNACLES (SHELTERS, IN-GATHERING, etc). On the 15th of Av/Av Menachem, a minor unbiblical feast called “Tu B’Av is observed in Israel. The moon’s appearance that day as Red/Orange Moon (a.k.a Blood Moon) may spell love to the Israelis but in actual fact, it spells danger/trouble for the Israelis. The Month of Av is the 11th Month on the Hebrew Calendar as per Genesis 1 and the 5th Month on the Hebrew Calendar as per Exodus 12:1-2. 11 is the number that spiritually signifies disorder. 5 is the number which spiritually signifies YAH Grace (a.k.a Divine Favour). On the Gregorian Calendar, we are in the month of July which is the 7th month of year, hence signifying Perfection, Shalom and Rest. This, therefore is a highly spiritually significant period! Every appearance of a blood red moon in the skies points to how imminent YAHUSHUA HA MASHIACH’S Second Coming is. It’s a warning and preparation sign and wonder! If this kind of Total Eclipse has not happened in over 100 years and is going to be a full lunar eclipse plus seen around the world for over an hour, then this certainly is a serious season! A serious message is being passed on! Please do take great care. Start to check yourself spiritually and deal with things you don’t like, can’t stand in your life. Ask YAH Almighty to cleanse and purify you as well as deliver you from anything that can hinder you enjoying YAH’S Will for you! This Lunar sign seems to point to and bear a message for the Nation/State of Israel because the Nation/State of Israel is the only country in the world whose calendar is determined by the moon (lunar). Additionally, it also sends a message to all of spiritual Israel (both biological and adopted through the Mighty and Precious BLOOD OF YAHUSHUA HA MASHIACH) around the world. Click here to read very important related prophetic words.